This amazing product uses multi-coloured LED's to recreate the brilliant colours of a rainbow - nature's most beautiful light show. 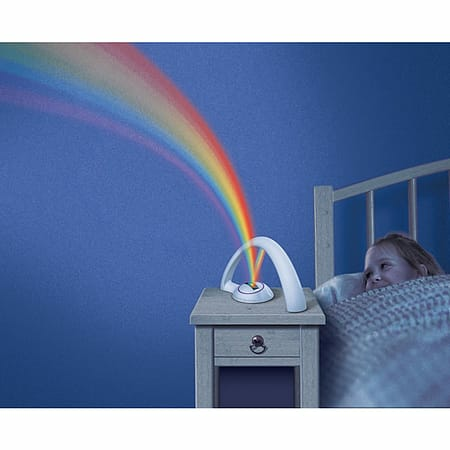 You can transform your room into a magical and colourful Wonderland by projecting the beautiful rainbow arc onto walls and ceilings. A sure way to make any room a happier and relaxing place to hang out! Includes an auto shut-off mechanism when not in use and an instruction sheet with fun rainbow facts. Now that kids grow out of toys earlier and earlier, Rainbow-in-My-Room will appeal to kids into their tween and teen years. Perfect for pyjama parties and sleepovers.